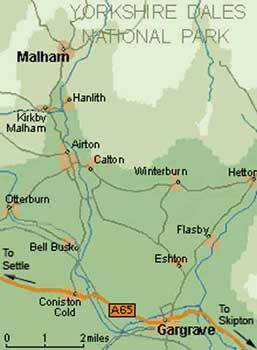 Malham is about 21 miles from the end of the M65, which terminates in Colne. 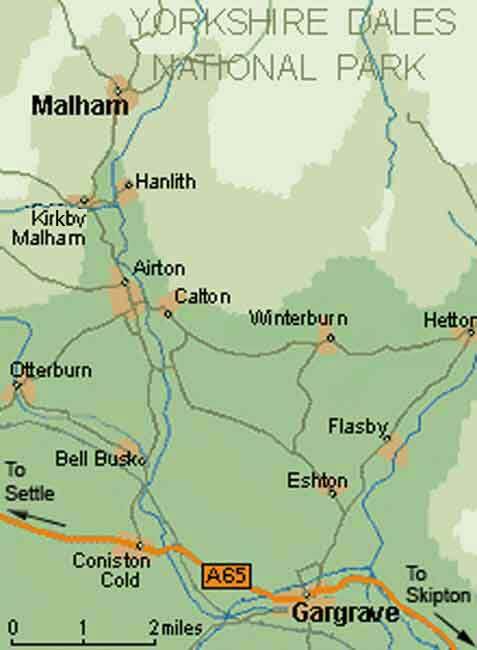 The map on this page shows the local roads and villages around Malham. Please note that all the roads between Gargrave and Malham are narrow country lanes, many of which have passing places for traffic coming the other way. The main (pay) car park in Malham is the Yorkshire Dales National Park Centre, on your left as you come into the village from the south. On busy weekends the field on the right as you drive into the village is also available for (pay) parking. You can't miss them. Please park with consideration for other road users and please DO NOT park on the brow coming into and overlooking the Village. Local buses run to Malham from Skipton via Gargrave. on Mondays to Saturdays all year on routes 210 and 211. On Sundays and Bank Monday Mondays from Easter until mid-October (also monthly in the Winter months) the Cravenlink service links Ilkley and Skipton with Gargrave and Malham on routes 883 and 884. During the Easter and Summer School Holidays the Malham Tarn Shuttle bus (service 890) provides an approximately hourly service between Malham village, Malham Tarn and Settle via a very scenic route. There's also a through bus from Bradford and Skipton to Malham on Wednesdays in June and Summer school holidays on Dales Experience service 898. A PDF timetable of all bus services to Malham is available on the DalesBus website here. The nearest train station is Gargrave, which is about 7 miles away, although there are more frequent services to Skipton, around 11 miles away with services from Leeds & Bradford. The fantastically scenic Leeds - Settle - Carlisle line is also nearby. Follow the National Rail Enquiries link here for more information and timetables. Further information about bus and train services in the Yorkshire Dales is available on the Dalesbus website here.